Cleveland’s newest community fire station will be officially opened on Wednesday 6 February (10.45am). 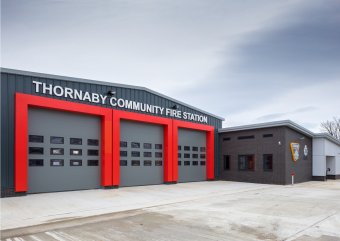 Thornaby Community Fire Station is the first to include purpose-built facilities to combine emergency services with Cleveland Police having a community team based at the Master Road site. The new station forms part of a major re-building programme – partly funded by Government grant – to ensure that the Brigade can continue to provide the very best fire and rescue service. It replaces the former station built in 1974. The single storey station has two fire engines and is the base for the Brigade’s water rescue unit. It also has a community room available for local groups to book for meetings and activities. As well as the official opening there will be a presentation of Long Service Awards to staff who have served for more than 20 years in the fire service. Chief Fire Officer Ian Hayton said: “The new facilities are important, not only in terms of emergency response to incidents for the area but also as a community hub. Being able to work in close collaboration with our colleagues in Cleveland Police has been a great success and we look forward to this continuing. The water rescue unit at Thornaby equips firefighters to tackle flooding incidents throughout the UK. The fully-fitted support vehicle includes an inflatable boat, ten and five person rescue sleds, two inflatable walkways, decontamination spray units and first aid equipment. The unit has a capacity to carry out water rescues for local, regional and national deployment. There is also convertible office space for incident command centre and crew welfare. In addition an emergency response boat, is stationed at the Tees Barrage, and is available for rapid response to water rescue incidents. The original Thornaby station was set-up during World War Two on the corner of George Street it had two fire engines, one manned by whole-time firefighters, the other by retained firefighters. To alert the retained firefighters to a call the air-raid siren on the top of the building was sounded. The new station will be officially opened by Chief Fire Officer Ian Hayton and Chair of the Cleveland Fire Authority Councillor Jan Brunton Dobson. The station will be open to the public for community drop-in from 2pm – 4pm, with a number of local school children already set to attend.